Every collection needs a good ring set. 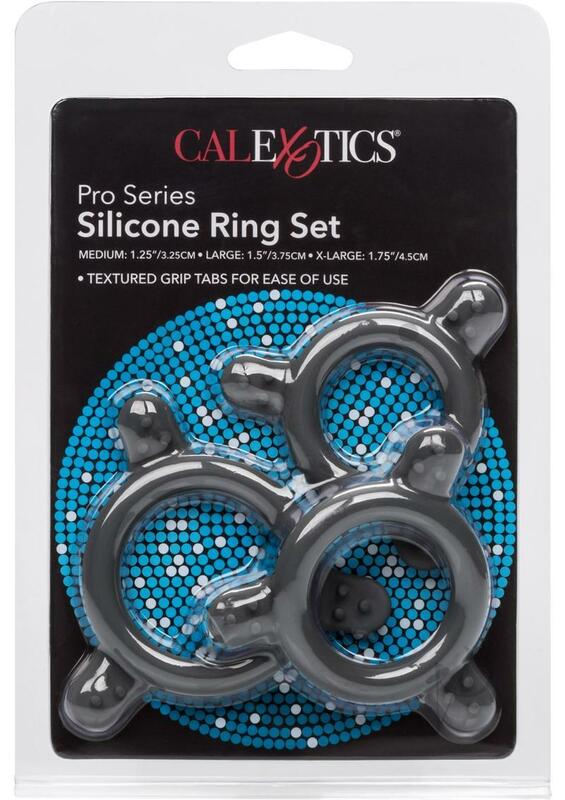 Created with ultra-durable, super-stretchy silicone, and designed with textured easy grip tabs for easy on and off action, this Pro Series set is the perfect fit. Three sizes to choose from make it perfect for any use you desire. Use one at a time, or use them all at once. The possibilities are endless. Slide in to support that lasts. The extra thick rings are sturdy enough for the most avid users. The superior quality silicone is stretchy enough for ultimate comfort, yet durable enough to last. This trifecta of performance will elevate your stature and extend your pleasure. When you're ready to use or remove, just grab a hold of the easy grip tabs and easily slide where you need it. Stamina never felt so good. Enhance your assets with this multi-pack, and perform like a pro.